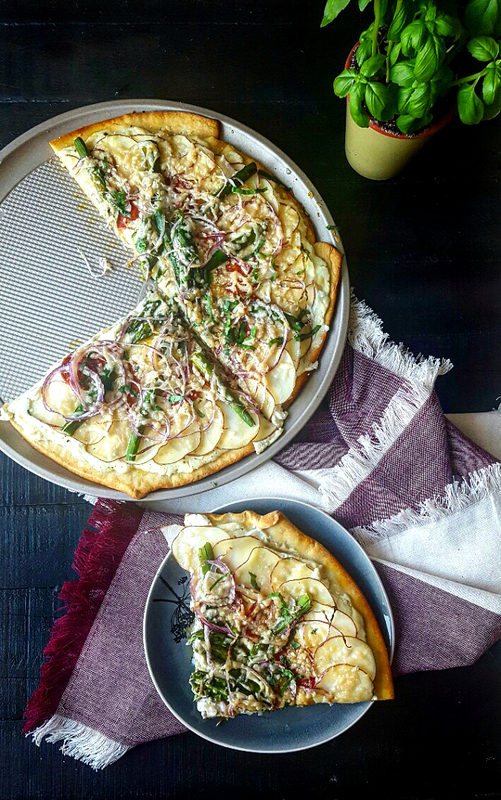 My Ricotta, Potato & Asparagus Pizza is pretty easy to make, a fun twist on your typical tomato sauce based pizza, and is great as leftovers for lunch. 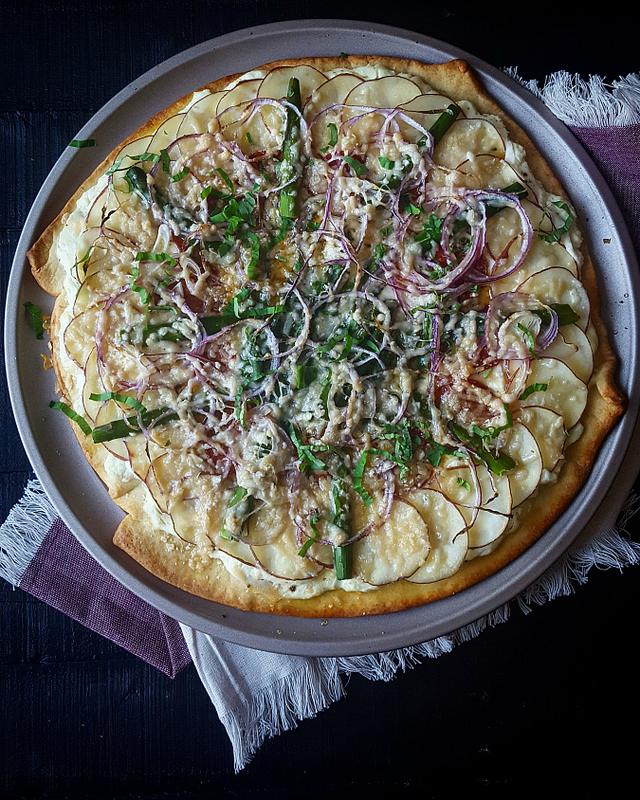 My friends at oxo sent me 3 new-to-me products to try and use to make this pizza, but I received no monetary compensation, and as always, all opinions are my own. Non-Stick Pro Pizza Pan features a micro-textured pattern to improve airflow for even baking and rigidity for strength and durability. Complete Grate & Slice Set includes coarse and medium grating and straight and julienne slicing surfaces. Each can be used over bowls or plates or placed on top of the lid, which doubles as a container for collecting and measuring. 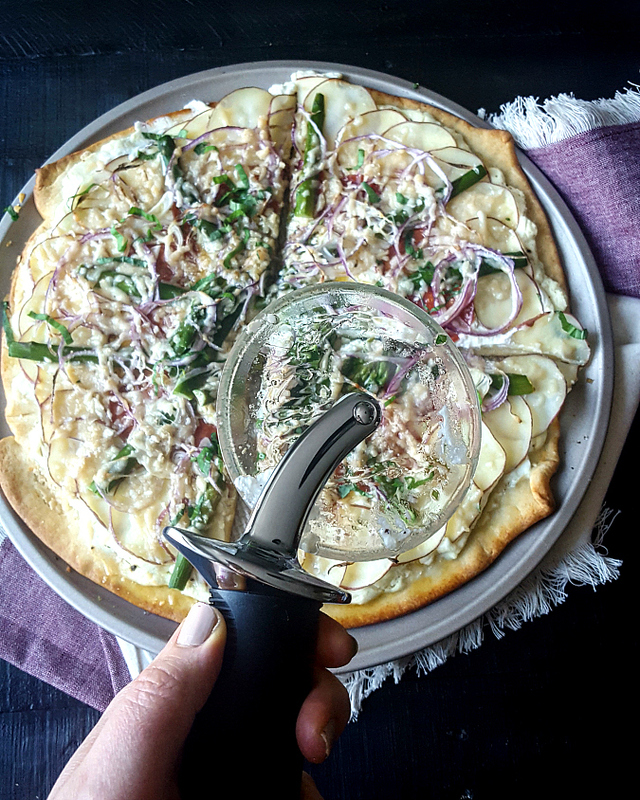 4" Pizza Wheel's clear plastic wheel won't damage non-stick pans, and the slick surface prevents cheese from sticking. Let's talk about the pizza pan: it has a good weight to it, browns things evenly, and can be easily used for baking cookies, free-form tarts or even roasting potatoes. 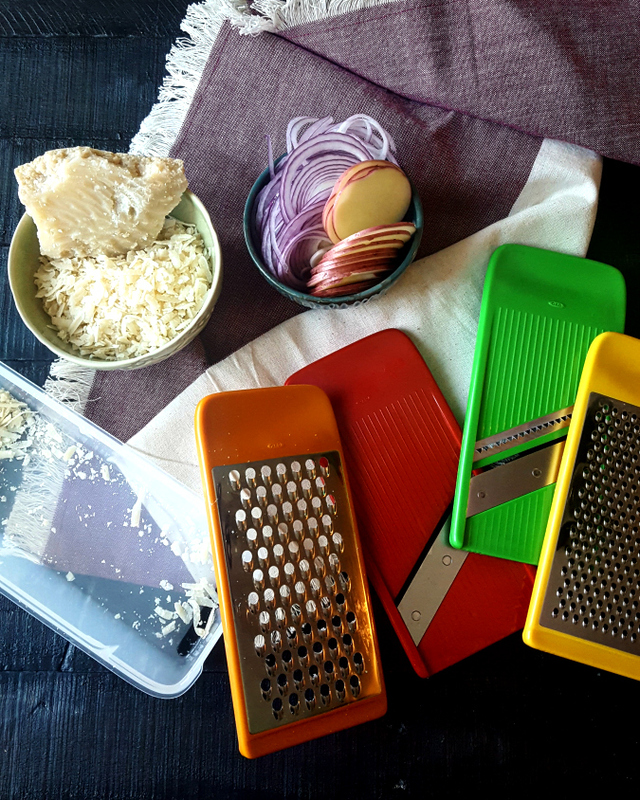 I loved the grate & slice set because of the ease of use and because all the components nest into one container! The pizza wheel worked pretty well, but I did have to apply more pressure than I expected. 2. Roll out the pizza dough on a lightly oiled pizza pan and bake for 5-10 minutes depending on the thickness of the pizza. You want to pre-bake it slightly before adding the rest of the ingredients. 3. Meanwhile, simmer potatoes for 5 minutes in salted water, then add asparagus and continue simmering for another 3 minutes. Drain and cool. 4. Spread ricotta on pre-baked pizza dough and season well with salt and pepper. 5. Arrange potatoes, asparagus and sausage in a fun pattern. 6. Bake pizza for 15 minutes. 7. 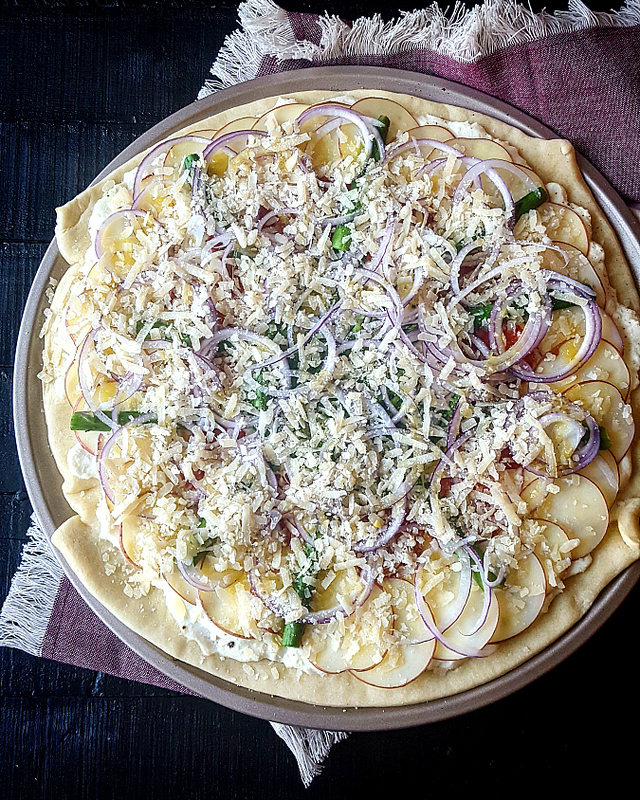 Top the pizza with red onions, drizzle of olive oil and Parmesan cheese and bake for another 10-15 minutes. 8. Top with fresh basil. 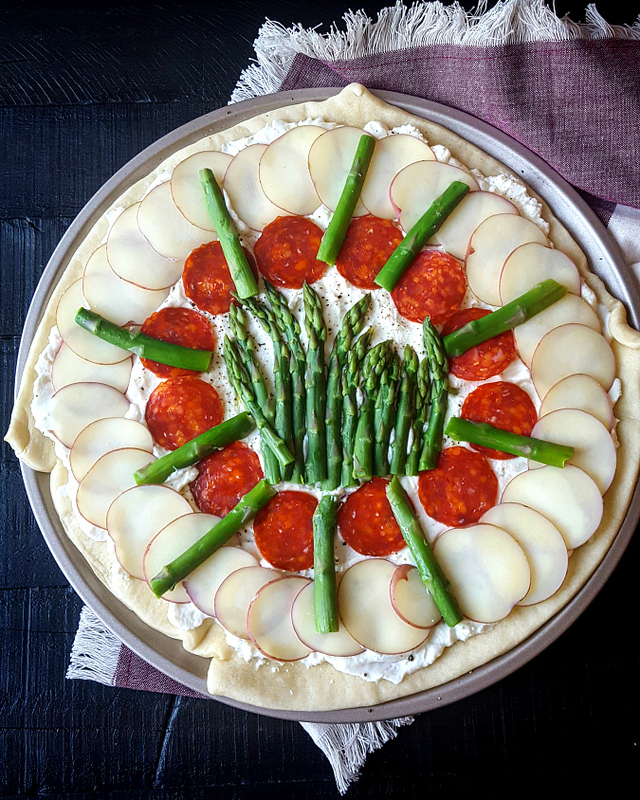 Isn't this a pretty pizza? 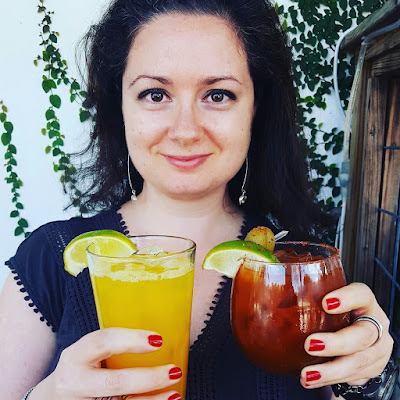 You can completely leave out the sausage if you want to keep it vegetarian.